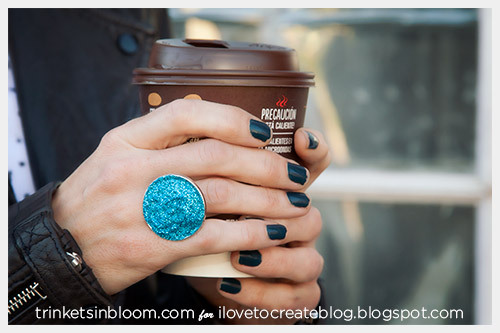 Add a pop of color to your hands with this simple and fun to make Glitter Ring DIY. With so many fun glitter colors to choose from you can make one in every color. They’d be perfect gifts for the holidays or a fun project to make with friends. Let’s get started! 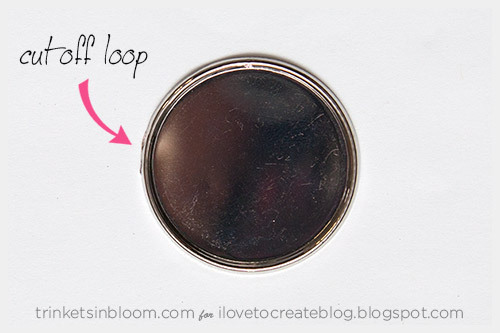 If you are using a blank pendant as the top of your ring, you will need to cut off the loop. You can do this with wire cutters. If you have a ring base with a large top you can skip this step. 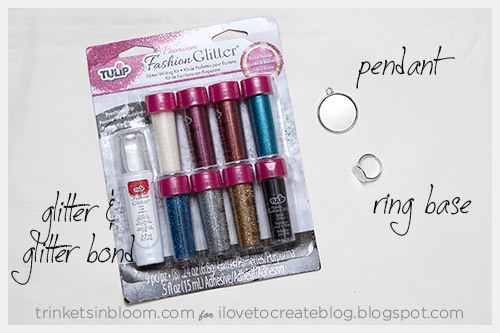 Fill the top of your ring base or blank pendant with your Tulip Glitter Bond. I made mine thick and uneven for more of a geode or crystal look. 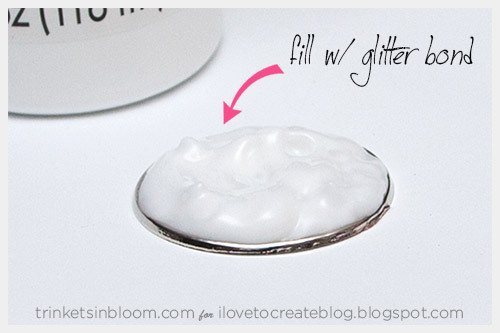 Sprinkle your glitter right on top of your glitter bond. 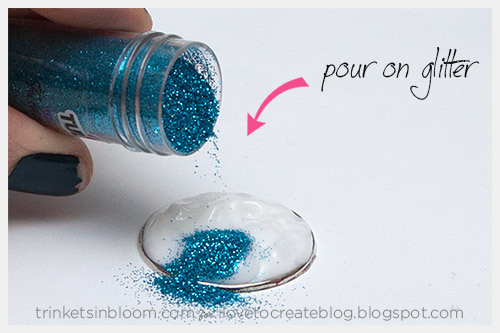 You can add a lot of glitter and then carefully shake it off, so you don’t move the glue. Leave it somewhere to dry overnight or longer. 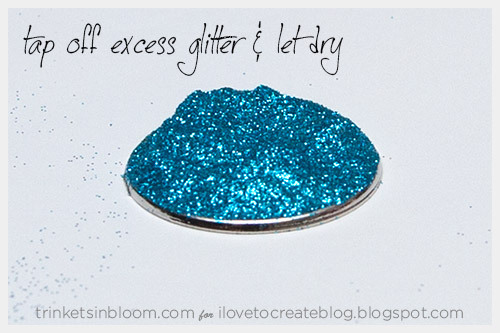 Since the Glitter Bond is thick, you’ll want to let it dry for at least 24 hours. If you used a ring base with a large top once your ring is dry you’re ready to wear it. If you are using a blank pendant for the top go to step 4. Using a strong glue like Aleene’s Jewelry and Metal glue or the Adhesive tabs, apply a drop of glue to the top of your ring and place the glittered pendant on top. Carefully press them together and then let the glue dry. 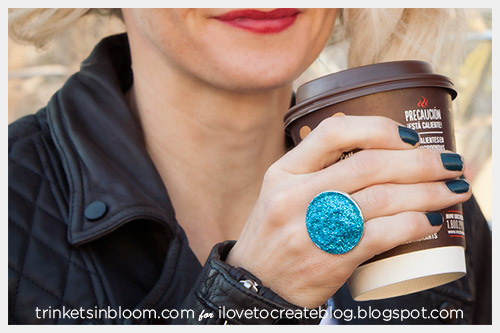 To see more unique fashion DIY tutorials check out my blog Trinkets in Bloom. 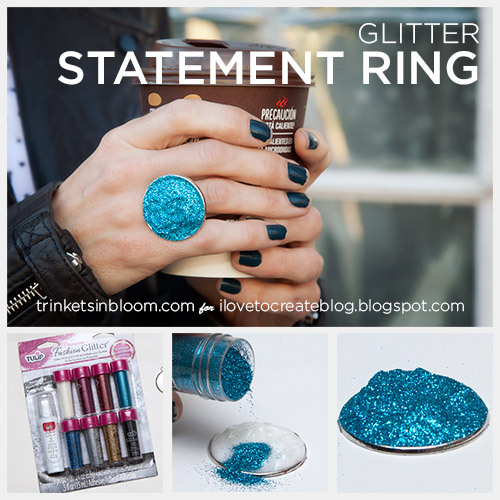 love statement rings - definitely want to try this!